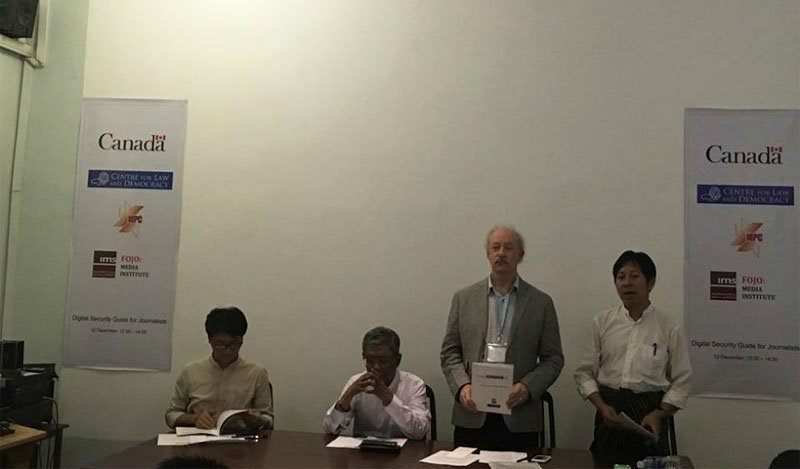 The Digital Security Guide for Journalists was launched on Tuesday at French Institute Meeting Hall in Yangon. The guide aimed to offer assistance to journalists in protecting their data, devices and identities, said the organisers of the event, including Myanmar Press Council, Centre for Law and Democracy and International Media Support. Most journalists, despite knowing the potential dangers of being hacked, were not adopting the basic protections in the digital world according to Tony Mandel, executive director at Centre for Law and Democracy. Mandel then provided several examples of journalists who failed to secure their information around the world, leading to legal or even deadly consequences to themselves and their sources. According to him, not only was it important for journalists to take safety measures to guard their data, but their devices as well -- protecting the data was no use at all if someone was inside one’s device. “A journalist may use strong encryptions for their communications, but that is useless if their digital devices are captured by the hackers,” according to Mandel, quoting the European Central Studies. Not many journalists can be immune to the invasion. According to Mandel, with reference to Google security engineers, 21 of the top 25 news organisations around the world had been targeted for State-sponsored attacks. “So if you’re doing interesting journalism, somebody wants to attack you,” said Mandel. U Thiha Saw, secretary at Myanmar Press Council said that as the general trend of media was switching from printed to digital, the need for digital security was vital, more than ever. He mentioned that social media like Facebook could be a source of leaking information as well. It can also be used as a tool to monitor and even assault journalists. According to Mandel, women tended to suffer more on social media especially when they covered political stories. “The insults, the death threats, the email, the tweets and comments can turn into daily annoyance. This is really nasty stuff. It’s just a part of my daily life,” said a female journalist. This was likely to develop into long-term psychological damages, too, according to Mandel. The legal officer at Centre for Law and Democracy, Portia Karegeya, who drafted the Digital Security Guide for journalists summarised the key points of the guide. “As journalists, in 2017, you don’t have much choice -- you have to use digital protections,” said Karegeya. According to her, the guide provided specific and technical advice to encrypt one’s information or to remain anonymous. It also presented different digital tools that journalists can use to protect their computers and mobile devices. Karegeya said journalists should also take time to think of what their risks and threats were. Karegeya gave her tips for journalists in a digital world, “strong passwords ought to be random, meaning they have a mixture of letters and numbers and you want them to be long. Make your passwords phrases.” When communicating via email, using two-factor authentication, meaning having two steps to access the account, was ideal. According to the United Nations, untargeted mass surveillance is a breach of freedom of expression. “It’s not acceptable. Surveillance should always be targeted,” said Mandel. No monitoring system was known to keep track of government’s surveillance, however, according to the organisers.